In 2016, aged 88 Leo Sutton still weighed 63 kg – his running weight as a boundary umpire on the VFL panel between 1950 and 1960. When Prime Minister, Robert Menzies made the decision to move the complete Department of Supply to Canberra Leo and his family relocated in 1968. “I had no choice but to move my family, it was either that or lose my job and I couldn’t afford to do that with four young children,” reflected Leo in a 2016 chat with AFLUA CEO Peter Howe. 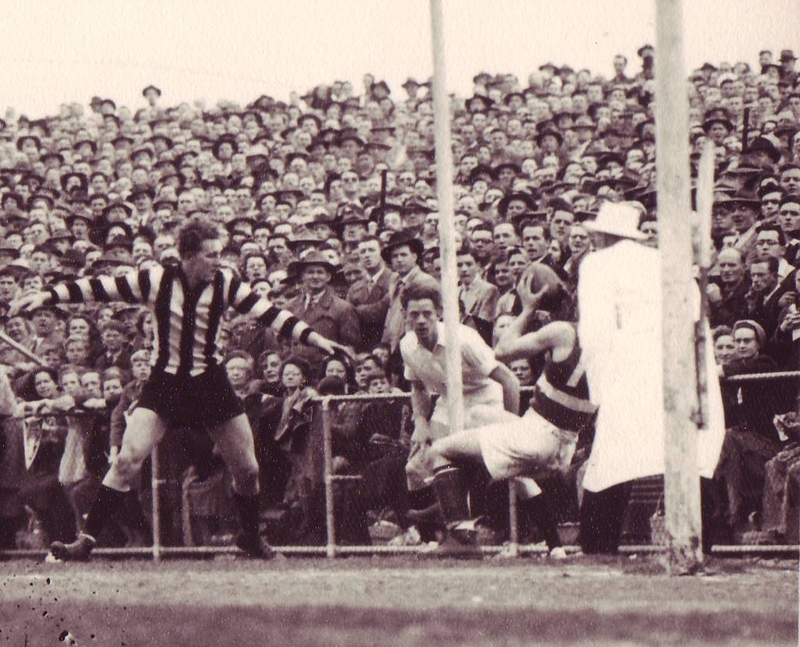 In 1948 as a twenty-year-old Leo joined the VFL Second Eighteens panel, umpiring the 1949 grand final and was promoted to the senior VFL panel in 1950. “In those days you were required to bring your own trainer to the game. My trainer was Australian middleweight boxing champion, Al Basten. I trained with Al for many years in his Essendon gym so it was a logical choice really. Al certainly had a presence when required,” recalled Leo with a smile on his face. “Al might have quietened a few club officials who wanted to get stuck into the umpires after the games.” Although it didn’t stop Carlton secretary Harry Bell from assaulting and abusing field umpire Ian Cleland as he Sutton and fellow boundary umpire Frank McArthur as they left the ground at Arden Street in 1950. Leo umpired 172 VFL games between 1950 and 1960 which included 10 finals and the 1953 and 1957 VFL Grand Finals. Leo also umpired the 1956 and 1957 night grand finals. However, Leo’s most memorable moment came in the national carnival. Fos Williams was playing for the SANFL and his namesake, Charlie Sutton playing for the Vics. They clashed on the boundary line with Fos taking a sly shot at Charlie after the ball had gone. At the next field bounce the pack cleared with Fos laying on the ground. “Charlie had skirted the pack and took Fos out with a shirtfront just as he took possession of the ball, I still remember the force of the contact as I sit here today,” recalled Leo. Leo retired in 1960 at age 33, the same year he achieved VFLUA life membership. “I didn’t want to become a statistic, I wanted to retire before I was told to go. I thought I might take up goal umpiring but that didn’t eventuate because of my eyesight.” After a couple of years as a tribunal member at the Essendon District league Leo walked away from football and continued his life in the public service. In 1968 after being transferred to Canberra he took up goal umpiring for the 1968 season and then went onto to the board to assist the umpire’s advisor at the time, former VFL umpire Roly Grant. Leo led an incredibly active life right to the end despite having six stents in his heart from a number of heart attacks. For years he was a regular attendee at the VFL/AFL Grand Final Umpires Annual Dinner. Many years following the passing of his first wife in 1981, he married his second wife, Shirley. Their voluntary work included palliative care which Shirley had introduced into the Australian Capital Territory. Leo was the public officer for both the Canberra arm of Palliative Care and the national body. Additionally, he was a long-time volunteer in various organisations including the Lions Club of Canberra Valley, where he helped establish emergency accommodation for woman and children in need. Leo Sutton passed away on 15 July 2017 after a life of great achievement both on the football field and the community.